Größe dieser Vorschau: 600 × 600 Pixel. Weitere Auflösungen: 240 × 240 Pixel | 480 × 480 Pixel | 768 × 768 Pixel | 1.260 × 1.260 Pixel. English: This view of Tethys was taken by Voyager 2 on August 26, 1981 from a range of 282,000 kilometers (175,000 miles). It is the best complete image acquired by the Voyager spacecraft. An enormous trench named Ithaca Chasma extends from the left side of the image to the upper center. 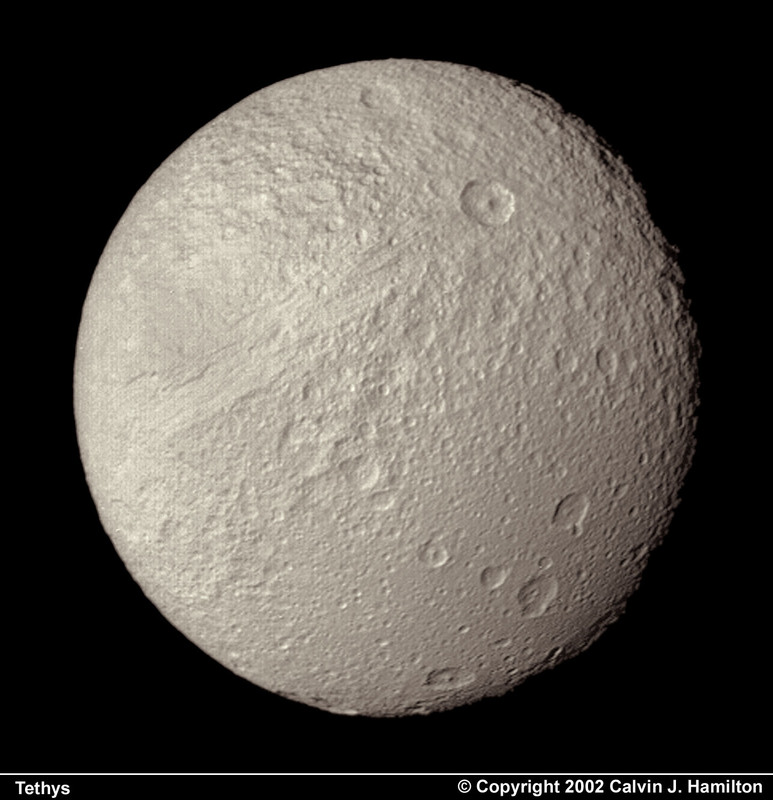 The fissure is about 65 kilometers (40 miles) wide, several kilometers deep, and extends across three-fourths of Tethys' circumference. The image also shows two types of terrain one of which is heavily cratered (top) and the other more lightly cratered (bottom). Both of Saturn's moons Dione and Rhea exhibit similar boundaries. Light cratering indicates that the region was once internally active, causing partial resurfacing of older terrain.